The Boots Holder Junior High Track meet scheduled for Saturday, April 20th has been canceled. Pauls Valley Junior High School is a comprehensive, three year public junior high school for grades 7, 8, and 9. We have 22 teachers and 2 full-time para-professionals. Current enrollment at PVJH is 332 students. PVJH has 103 students in seventh grade, 100 students in eighth grade, and 129 students in ninth grade. Pauls Valley Junior High School gains approximately 30 to 40 freshmen students yearly, from nearby Whitebead School, a dependent K-8 school. Pauls Valley Junior High strives to provide a caring, safe, supportive learning environment promoting self-discipline, creativity, motivation, and excellence in learning for all students. Students are taught to be life-long learners, with individual responsibility for self, school, and community. PVJH has outstanding programs for students with varying abilities. The professional, caring staff provides educational programs to meet a wide range of student abilities and needs. Pauls Valley Junior High provides a college preparatory/work ready curriculum and the core curriculum as specified in Senate Bill 1792. PVJH has a strong academic program that ensures each student is provided with many opportunities for academic success. 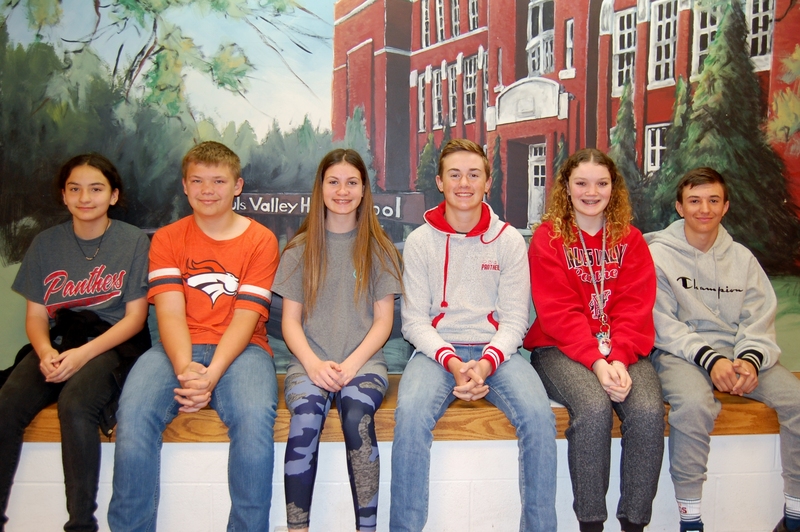 Pauls Valley Junior High students participate in numerous clubs and organizations that are actively involved in improving the school and community. Aubrey Solis is the daughter of Frank Solis Jr and Emerald Gonzalez. Her hobbies include singing, running and spending time with her family. At school she is on the basketball team and is in band. Her plans for the future are to go to Harvard and become be a lawyer or a teacher. Jase Ford is the son of Jeremy and Amber Hensley. His hobbies include playing football with his little brother. At school he is on the football, basketball and golf team. In the future he hopes to make it to the NLF. Averyl Bell is the daughter of Shawn and Senia Bell. Her hobbies including showing goats,being a livestock judge, golf and riding horses. At school she participates in FFA, golf and Spanish. Averyl’s future plans are to go college and become a dermatologist. Nathaniel Chronister is the son of Chad and Alaina Chronister. His hobbies include playing video games, sports and attending church. At school he is involved in golf,football, track, basketball, academic team, band, and student council. In the future he plans to attend college and become physical therapist. Talir Bennett is the daughter of Wes and Tiffany Williams and Matt Bennett. Her hobbies include swimming and playing volleyball. At school she enjoys being a cheerleader. In the future she plans to All-Star in cheer and work at a doggy day care. Jared Turner is the son of Jeremy and Annette Turner. His hobbies include playing baseball and PlayStation. At school Jared is on the baseball team. His future plans are to attend college and play professional baseball. Welcome back students! We hope you had a great summer and ready for a great year. We look forward to seeing your smiling faces! To provide each student a diverse education in a safe, supportive environment promoting self-discipline, creativity, motivation, and excellence in learning.